I traveled to New York City last week for work. It was only a day trip, but I tried to soak up as much of the city as possible in my short time there. I lived in NYC for two summers when I interned at MTV and Showtime during college and I learned a lot about the city during that time. BUT there's always so much to explore. 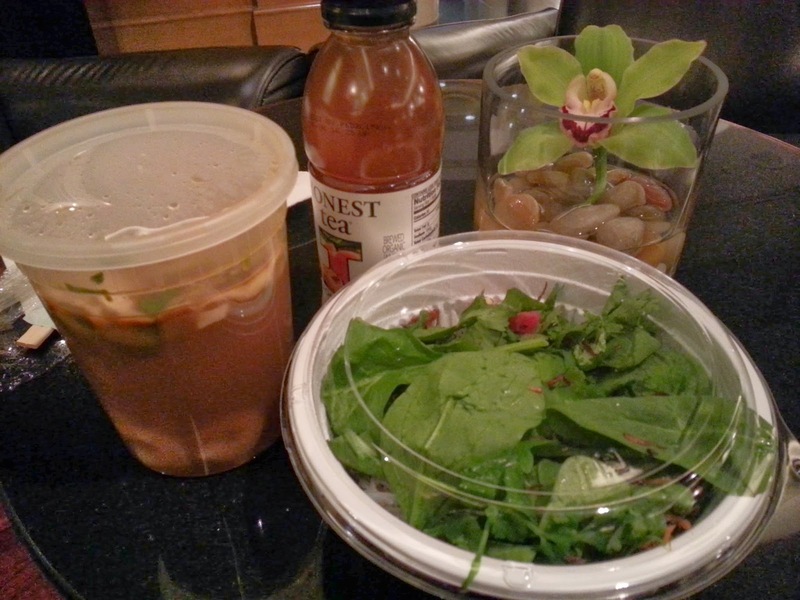 I thought I'd post this week about 3 reasons why NYC is so great for a day trip or even longer! And this is of course JUST scratching the surface of what NYC has to offer. NY is truly an easy city to get around. It's built in a perfect grid system and it's so easy to follow a map. Of course, walking is not only great for exercise, but also great for sightseeing. 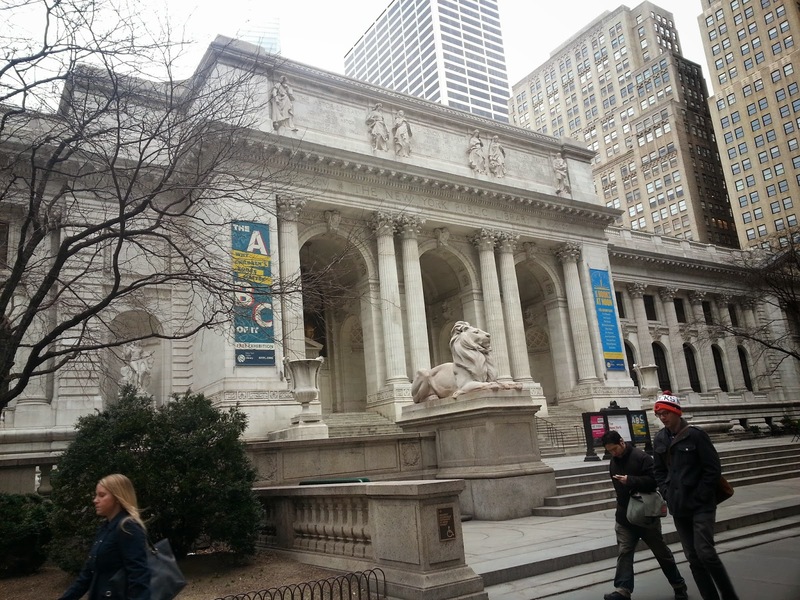 As I was walking from the train to my work meeting, I walked right past the New York Public Library (Yes, this is where Carrie Bradshaw was supposed to have her wedding for all those SITC fans). It's a beautiful building inside and out. There's SO much to see and do in NY. You never know what you'll see in NYC. I guess this could be good OR bad! 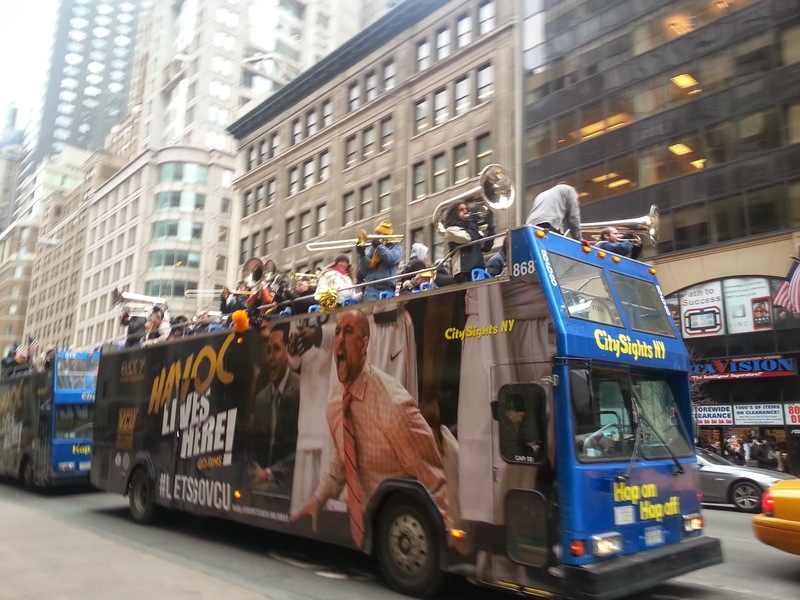 On my way to my meeting, I heard tubas and trumpets up ahead (remember, it was about 8:30am in the morning), and I came upon this lively double decker bus. This was a college band playing an upbeat song in preparation for the March Madness basketball game that night. I saw lots of smiles on the street though, which is something you don't always see in NYC. You also never know WHO you'll see. As I said before, I'm a celebrity watching junkie. NYC is a great place to see random celebrities being "normal". Hey - who ever thought I'd see Martha Stewart in a Speedo shop!? I didn't see any celebrities this trip though. Oh, the food. NYC has a TON of diverse restaurants. You just can't keep up with all the options! I knew I had to seek out an awesome lunch that day, so I ended up walking outside and following a constant flow of take out bags. Yes, I followed take out bags! There were a number of professionals carrying eye catching bags of food who looked like they were on their lunch break. I knew I had to figure out where those bags were coming from. 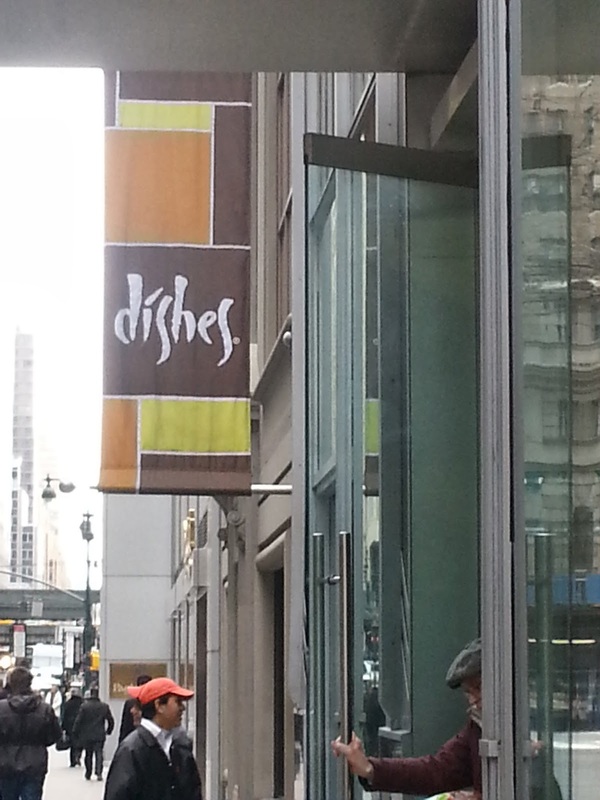 I finally found the source - a restaurant called Dishes. They offer a bunch of ethnic food options. I went straight for the "noodle bowls" since it was a cold day and I love noodle bowls! 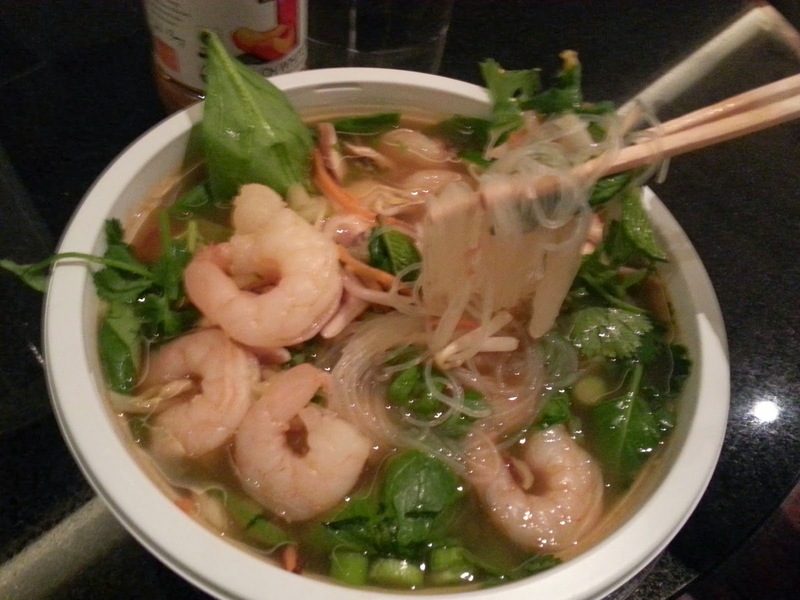 I ordered a noodle bowl with shrimp, rice noodles and all the veggies they could stuff in there. It was AWESOME. We haven't taken 3 year old Little Guy to NYC so far, so I have not tried to find a food allergy friendly restaurant...yet. But I'm guessing with a little research we can find a great restaurant who can offer a tasty and safe meal. So, those are a few of my reasons I miss NYC. What do you think of New York? Love it or not? I think that restaurant "Dishes" was on Food Network! Your lunch looks yummy. One of these years I have to back to NY to see another Broadway Show, I miss that. NYC is pretty cool! Glad you had fun Kathryn! Ooh, I didn't know that about Dishes, Diane. I'll have to keep my eye out for it on Food Network!